VoIP Innovations, North America’s premier wholesale VoIP carrier, announced the latest release of its BackOffice portal, TITANIUM III. 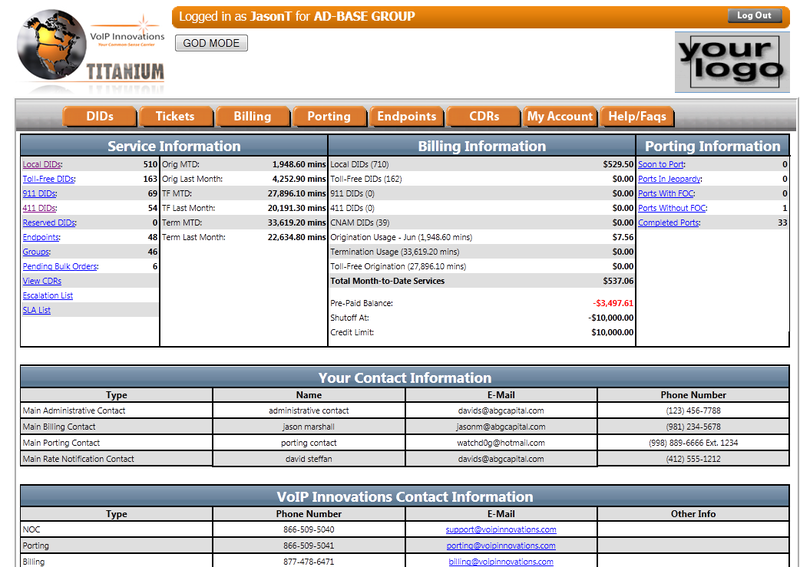 The new reports and tools are designed to help ITSP's manage their wholesale VoIP DID operations. VoIP Innovations, North America’s premier wholesale VoIP carrier, announced the launch of its latest BackOffice portal, TITANIUM III. “We completely redeveloped the BackOffice from the ground up to provide better reporting and tools our ITSP's were looking for", states Jason Tapolci, President for VoIP Innovations. As a wholesale VoIP carrier, VoIP Innovations provides wholesale VoIP origination and termination to some of the nation’s largest internet telephony service providers. The new BackOffice provides better LNP (Local Number Portability) management, DID inventory overview, integrated ticketing system, Dashboard reports that provide a high level overview, and much more. "As a wholesale VoIP carrier for DID's and termination, we decided that we wanted to provide more than just the service to our customers," stated Corey Potts, VP of Sales for VoIP Innovations. "We wanted to not only provide the DIDs' but also provide reporting, additional functionality and a BackOffice portal that would provide real-time provisioning for services." While many carriers focus only on providing the DID and termination service, VoIP Innovations provides an actual BackOffice that many ITSP's find necessary to help them better manage their operations from an inventory and financial basis. VoIP Innovations is already working on TITANIUM IV which will include SMS, fax to email and a few other customer requested features as well. These features will be rolled out to existing customers first. VoIP Innovations is an IP-based wholesale VoIP communications provider with more than 20 years of experience in the VoIP industry. Based in Pittsburgh, PA, VoIP Innovations employs over 50 people and boasts one of the nation's largest VoIP network footprints. They are owned and operated by ABG Capital. To learn more about VoIP Innovations, visit them at http://www.voipinnovations.com or 877-478-6471.